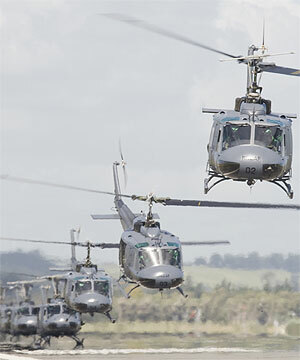 The RNZAF managed to scramble all of its old Iroquois and Sioux helicopters at the same time in December 2008. The 19 helicopters, which are all of Vietnam vintage, completed a short flight over the towns around Ohakea air force base yesterday. Operations flight commander Squadron Leader Nigel Cooper said it was a rare occurrence that not one helicopter was in for scheduled maintenance and a sight that might not be seen again as all the aircraft were scheduled to be replaced over the next two years. He said the flyover was a thank you to the local community and a demonstration of the credibility and capability of the air force. Christmas Present anyone..? Colin Fraser found this advert in the latest edition of 'Mufti' in Australia, price is Aus$. The website is starting a 'Family/Whanau Story' section - a place where those who knew their veteran as more than a soldier can share about him with others. To start the section the stories on the Barkle reunion and Harry Hemana's funeral have been relocated. So a very keen invitation is extended to any W3 family or 'dependants' [as the Army liked to call those close to a soldier] reading the website to offer a story. The Family/Whanau index page and suggestions on how to contribute are here. Contact has been established with Joe Yandall's family through his daughter Moana Grove. The way it was established was a little unusual, starting with the presentation of service medals to Isabel Beaumont NZ Red Cross in London in September 2008. The NZ Red Cross compiled a photo album for presentation to Isabel which included photos taken from the W3 website photo pages and some of these, including a photo of Isabel with Wally Joe, Bob Newson and Joe Yandall were shown during a news item on NZ television and seen by Joe's family. Moana then located Isabel's email address and asked for the original for her mother. Isabel pointed Moana back to Andrew McKie at NZRC who redirected the query to me as webmaster. By happy coincidence the photo was one of the few photos I took in Vietnam and I have been able to locate the original which is being forwarded to Moana this week. For those wanting further contact with Joe's family I have added Moana's email address here. I have added Isabel's email address here. As part of the MOU with the NZ Government the Law Commission is undertaking a comprehensive review of the War Pensions Act [WPA] – and are seeking answers to important questions that may affect you. 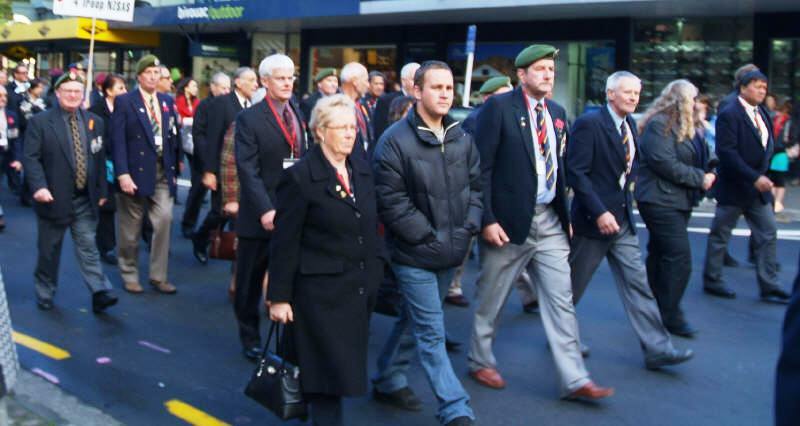 The Law Commission has asked NZDF to consult its personnel over the implications of any changes to the War Pensions Act and provide the Law Commission with feedback. This is the first step in a journey to reform the war pensions system which will affect all veterans – past, present and future. NZDF wants its personnel to be recognised and adequately rewarded for their service through the veterans’ benefits and entitlements they receive. But they need older veterans help to ensure all veterans interests are looked after. This is your chance to have a say in the benefits that will be available to all veterans. It’s Your Voice, Your Choice! "The NZDF has been working on how best to arrange for those now serving to contribute to the War Pensions Act re-write process. Measures taken include attendance, as observers, by a serving military representative at the Law Commission's "Roadshow" now being held at RSA's up and down the country. This is good, because it ensures that the serving Force is able to see first-hand what the issues really are, as seen by veterans - a unique and important opportunity. The Defence Force will also be doing its own internal "roadshow" at camps and bases over the next few weeks. Accordingly we have arranged that the RSA interest will be represented at these sessions by District Presidents in their areas. This will enable us to hear first-hand what serving soldiers, sailors and airmen are saying, but also to make RSA views and capabilities known where appropriate. These and other things illustrate how the public undertakings to improve connections between ex-Service organisations and the serving military are now beginning to be put into effect. But this is a two-way street. There is not much future in veterans just waiting for Defence to "do something". We must be proactive, and work at it too. After all, one-third of the currently serving military - about 5,000 - come under the present definitions of "veteran". Or you can get there by going to the main page of the NZDF website and clicking on the link in the centre with the poppy called "Towards a new veterans' entitlements scheme - Your Voice, Your Choice", then scrolling down to the link "Fill in a simple online survey". Whether or not you have done - or intend to do - a separate response to the Law Commission's discussion document, please also participate in the survey now made available by the NZDF. While it doesn't cover everything you might want to say, it is part and parcel of the process, and is a great opportunity for you to make many points easily." Prior to Tribute08 I requested that the staff at the Auckland Museum Cenotaph update the records for the W3 Coy dead. This has finally been accomplished, using photographs provided from the website. Well done to the Cenotaph staff involved. Check the changes here compared to other veterans from Vietnam. I am researching who from W3 Coy was still in uniform in August 1987. If you were and I haven't contacted you please get in touch with me ASAP, use this email address. I want to know your rank, corps and posting. Update on MOU Latest Veterans Affairs update on payments made to and registration of veterans and their families. Challenging article Rex Alexander [V6] has an article in the latest issue of the EVSA Contact magazine. I have read the article several times and each time find something different and challenging in it. I have reproduced it here. It occurs to me that it speaks volumes of the conditions at home before and after our tour of active service, of close friendships forged in battle still important afterwards, of good support for young soldiers without going over the top, and of respect in all directions. See what you think. a selection of photos supplied by Trevor Philips have been added to several stories. Look for them among the existing stories. Here's one worth highlighting. More to come as I get the scanner working. I need help please to research the background to an article for the website. I'm trying to establish who was still in uniform in August 1987. I have separately emailed a number of veterans but if you haven't replied to my email or haven't heard from me at all and were in uniform then, please drop me a line saying your rank, corps, job and location/posting in August 1987. If your veteran is deceased could their next of kin please offer what they remember..? Much appreciated..! The link goes to the Government-sponsored website where any Vietnam veteran can leave a story for the grand-kids and the nation to read and appreciate their service. Enjoy the 1Pl V3 Coy order group..! Last year Alastair McKenzie and his supporters raised $50,000 for the Trust through the 'Ride of the Veterans'. This year Louise Mullane, daughter of Chris Mullane, is running in the New York Marathon under the Trust's banner and is donating 100% of all monies raised back to the Trust. In America she is being hosted by John Rowan, President of the Vietnam Veterans of America, who is commending her initiative to his Chapters and Members for whatever support they can give. Back here John Banks, Mayor of Auckland, has given his support to the venture and has provided Louise with a letter of introduction and support for her to give Mayor Michael Bloomberg of New York. Ross asks that veterans show their practical support for Louise and the Trust by making a pledge which they will 'call-in' after 2 November. This pledge can be done either through the link on their website or by replying to him direct. All pledges are acknowledged on their website and already they have received a great response. Their target is $50,000. The New Zealand Red Cross have succeeded in locating Isabel Beaumont. 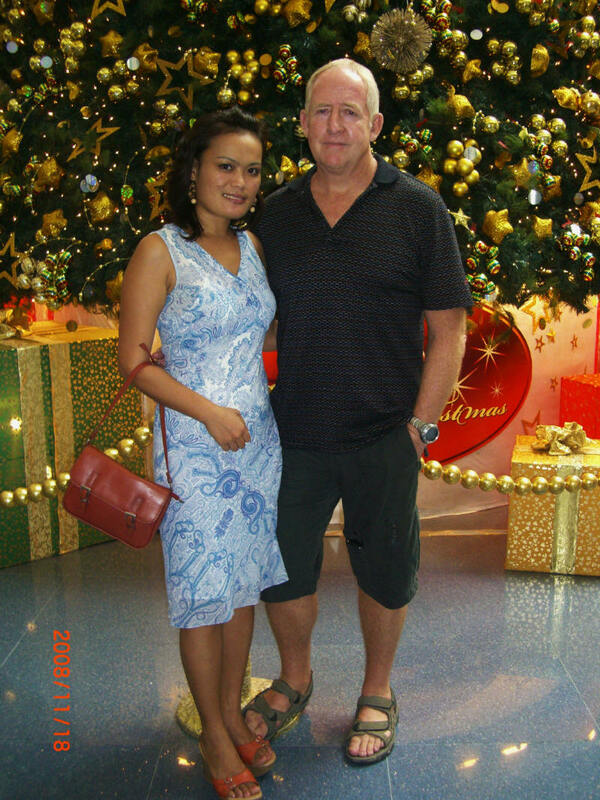 She married a RAF type in Singapore and after much time in Hong Kong now lives in Wales, married name Harris. The NZ Red Cross director will present her with her GSM and OSM medals in a ceremony in London first week of September, Isabel will travel to London with her family for the presentation. Offer 1: Any vets in the UK who want to meet up with Isabel can do so at the ceremony. Sunray has had the W3 pre-deployment photo taken by Mr Lee in Terendak late-1969 digitised. This has allowed the photograph to be sectioned to give better views of the individual faces. The photo is presented here. I wonder whether folk realise that Bob Upton is the Colonel of The Regiment, Royal New Zealand Infantry Regiment. Mark Binning sent me a photo that he had taken at the Basin Reserve of Bob presenting the rededicated Regimental Colour to 1 RNZIR. Apparently the ceremony had been put together at short notice and that meant Bob was unaware of the need to include his uniform in their Wellington bound kit. I am writing a series of background articles that attempt to describe the daily lifestyle and conditions under which Vietnam veterans toiled, basically with the aim of informing family and students. My teenage son's friends have asked me about life in the trenches so there's a gap in their understanding..! The first article is on the period in Nui Dat between operations, the 2nd on navigating and calling indirect fire support under the canopy, the 3rd under preparation is on the medical system supporting us, and the 4th will be about resupply in the field. There may be others, feel free to suggest topics. Also feel free to support me with facts, corrections and other stuff that make the articles less dry. Have you been taking your paludrine lately..? Remember how the anti-malarial tablets were available freely to help individuals avoid malaria, left in tins on the mess table, shoved down your throat by the platoon sergeant etc..? So if an individual failed to take paludrine daily he was thought of by others as irresponsible. What's my point..? Like paludrine, the veterans disability pension [VDP] is also available freely to help individuals alleviate the effects of their operational tour. If you are not receiving it to some degree then you are also irresponsible. There are several arguments raised by the irresponsible veteran: 'there are others worse off than me, let them have the money' is the most common. Another is to say 'this pain is old age, not attributable to my time as a young soldier in Vietnam'. The ultimate argument might be: 'I don't need the money'. Then use it to shout your grand-children an awesome experience, or upgrade your car. Lets look at some facts:  There is plenty of money in the veterans budget for all of us, so you going without won't mean someone else is allocated more money. Under the War Pensions Act an individual veteran can only be allocated a finite sum for their disabilities. Your spouse can also benefit long-term from your VDP if you reach a certain level of disability. Many problems in old age can be traced back to activity as a young soldier, such as PTSD, worn discs in your back, skin cancers, smoking related issues. So how do you reconcile your arguments with the facts..? Simple really. When you apply for a VDP you ask a panel a question, 'is my ailment attributable to my service in Vietnam..?' The panel ask specialists to review the issue and then make a decision. If they say 'no' then you have your answer, but if they say 'yes' then you receive some additional income and better still some long-term assistance with medical treatment. You can then choose another ailment and ask the question again. The number of ailments accepted increases your 'percentage' of disability. The preferred outcome of the process is to receive a combination of decisions that add up to more than 70% disability. At this level you are better off at 65 than receiving national superannuation. And your spouse also receives better treatment because when you depart on your next posting they will continue to receive 50% of what you were receiving prior to departure. Tell them they are not worth it...! The process starts with a phone call to War Pension Services 0800 553 003 if you are in New Zealand, or ++64 9 985 1070 if you are calling from overseas (but you pay for the call). Associated with the VDP is registration as a veteran. There were spouses at Tribute08 that were unhappy their irresponsible veteran had not registered himself and his family as part of the veteran community. Registration costs nothing but could lead to long-term benefits. The good news ladies, is that you can do it yourself. The forms are available on-line here, there are different forms for veterans [even if deceased], spouses, children and grand-children. The website visitor statistics indicate an average of 40 visitors a day at present. They also show that many of you are using the automatic update tool to be advised when changes are made, so here's a tip - don't use the URL address in the body of the update email. Each website page has a banner on top with the navigation links - but the update email URL only points to the bottom page [the welcome part] and the navigation banner is missing which makes further browsing difficult. When you get the update email use a bookmark to the site address to get full functionality. I'm half-way through Chris Stock's photo collection, some unique shots still to come, then I have Trevor Philip's slides to do. Should be finished in a month or so..... Enjoy your browsing, and sent in some stories huh...? Tribute08 was a kaleidoscope of emotions for veterans. Each of us would have had a different perspective of what the reunion was for. For most it was to see mates. For some it was to hear the apologies and judge their sincerity. 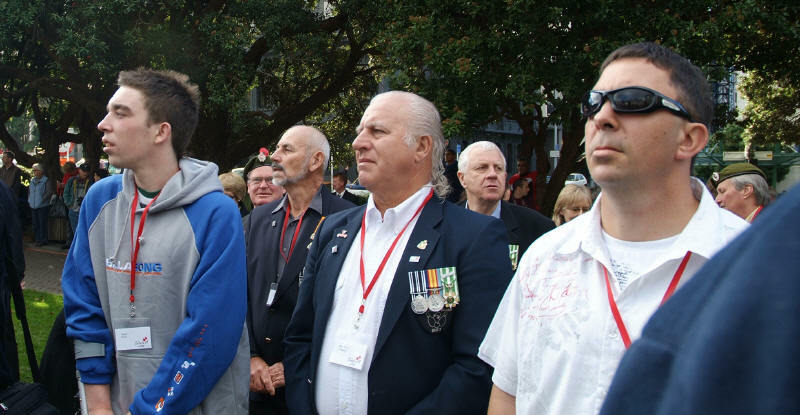 For others it meant introducing whanau to the experience of being a veteran. To others it was to give back to the veterans, to some to give it back to the anti-war protesters, like this [extract] from Finlay Macdonald writing in the Dominion Post on Sunday 1 June: "Ironically, one of the ways a society can distance itself sufficiently from participation in an atrocity such as Vietnam, in order to eventually reach the kind of consensus that allows for a formal apology, is by turning away from it for so long.... Of course that is unfair to the individuals who did nothing more than serve where their government sent them. But to have brought them home with parades and pipe bands would have been a denial of the truth of the times that this shabby war and our reluctant, token contribution to it was indeed something to be ashamed of... It was not the time for magnanimous gestures, it was the time for consigning an outmoded political mindset to the dustbin of history. If in the process the poor dupes of that mindset were similarly consigned, such is the hard reality of being in the killing business. Yes, our soldiers were exposed to the defoliant poisons that also killed and deformed so many Vietnamese. And the interminable delay in accepting this and compensating the victims is unconscionable. It's a mark of how our engagement in the war was conducted in such bad faith that nothing honourable could be salvaged from it for decades. Do they never give up..? 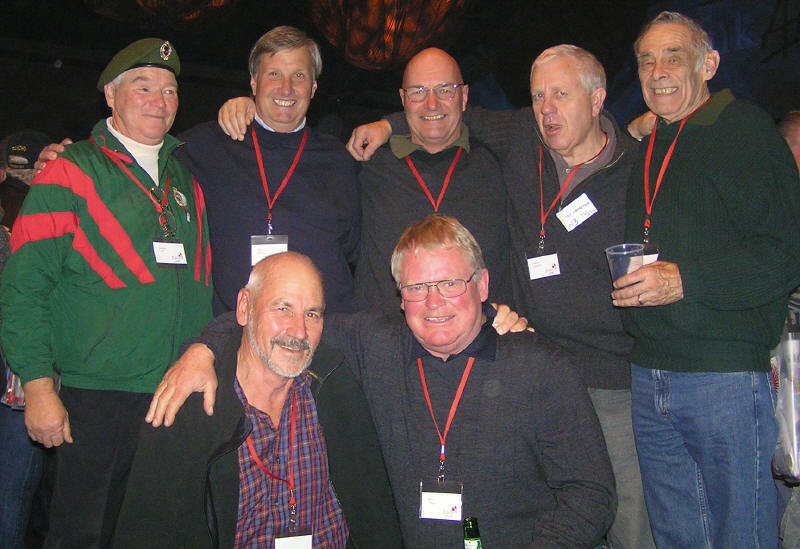 Meeting with mates and inducting family into the veteran whanau are givens at every reunion, suffice to say that the friendships were as strong as ever. This time the march to Parliament was more relaxed, the clapping and the flypasts expected and overall the emotional level was much lower with fewer in obvious grief than previous times. 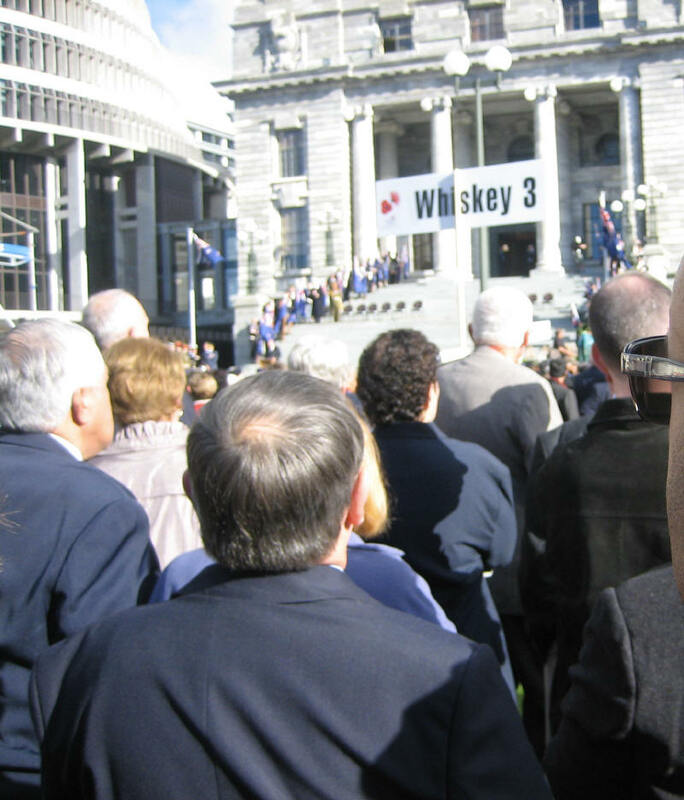 The lengthy speeches and associated protocol was thought by many to be unnecessary, especially the lack of translation of the Maori. The welcome at Parliament was interesting and seeing our fallen honoured as they were was very well received. The Sunday service at the National War Memorial was likewise well received, especially Padre Carde's very pointed comments and prayers. 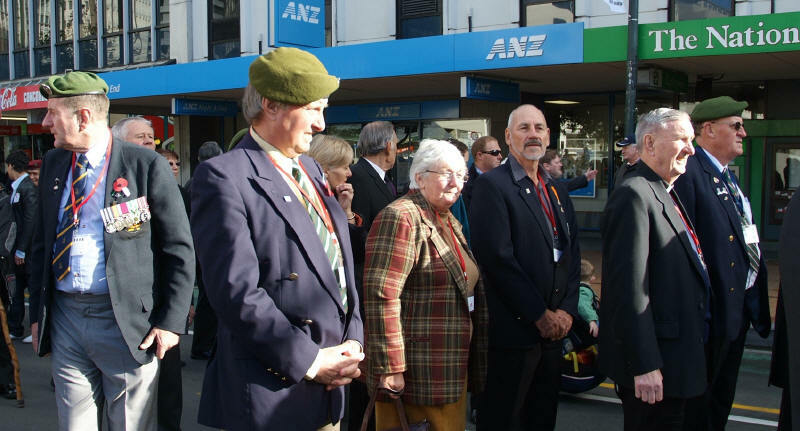 In the end it was seeing the Royal Tri-service Guard and the Regimental Colour of 1RNZIR paraded and rededicated that meant the most to me; it made me realise what the military family had had to endure for 40-years as the veterans battled the political masters for our right to stand proud. From the standing ovation given at the end of Gen Mateparae's apology I believe that others also felt how important it was to have 'rejoined the ranks' again. One close to the General commented afterwards about how nervous the General had felt about the reception he would receive, given that all his career he had been trained and guided by Vietnam veterans, and the relief experienced when we rose in a standing ovation to accept more willingly than any other offered his apology for the NZDF failing us. The figures for website visitors grew hugely over April and May, with May totalling 942 unique visitors at a daily average of 44.1, high days had 60 or more visitors, probably due to updates about Tribute08, the News page had 529 visitors. Visitors from the USA remained high at twice that of NZ visitors. In common with other websites, around 66% of visitors only remained for less than 30 seconds, either finding that the information was quickly available [I hope so..!] or of no interest long-term. I hope that following discussion among W3 veterans in Wellington this weekend more will use the site and offer articles or news. If you are an overseas visitor to the website, welcome...! 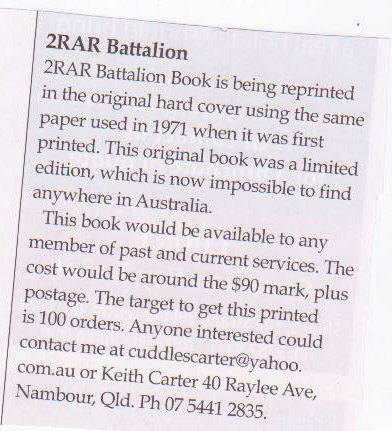 I trust you will enjoy reading a record of what some New Zealand veterans achieved in the Vietnam conflict. I would be happy to publish emails from visitors, please use this link and identify your background.